I’ve ordered myself a copy, but have not received it yet… When I do, I’ll post again to let you know what I think of the quality of Blurb books. It was a fun process putting this one together, anyway… Kept me out of trouble! UPDATE (2/11/08): I received my copy of the book and am mostly please with it. I made it “private” on Blurb for right now as I want to make a few edits. When I’m done, I’ll put it back up on Blurb. It’s pretty exciting!!! This entry was posted in fungi, photography, winter. Bookmark the permalink. Wow, I’ve heard about self publishing books. Congratulations! Does it cost money to produce the book? Or do you just design it and people then pay for it? Oh… P.S. to Tom: you should do one on saw-whets! 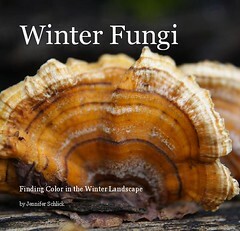 Nice fungus book with great color pictures. I would encourage you to do more. Nice job! What fun to self publish. Very cool Jen!! I’ll bring mine to Jamestown when I visit this summer so you can autograph it! Thanks Jennifer for the information about publishing the book. Just wanted to let you know that I think you had me confused for Mon@rch! No worries, I love his blog. I LOVE fungi. Can hardly wait to get my mitts on this one.